WRITING GROUPS : CIA, TOP. LINES HIT : M's, LL's, J's, RR's, B's, D's, 2's, 5's. CRIME79 was a bright light on the BMT line where he and his partner -BABY168 - threw up one burner after another. All the younger toys jostled for position to get photos of CRIME's latest creations as they flew into the elevated stations. He competed with the best style masters of his time and always held his own if not burning them outright. I had a chance to meet with him recently and jumped at the idea of doing an interview. Writers of this stature are usually a headache. They're either too egocentric to do a fair interview with, or, they've been living the thug life so long that they can only speak with mono syllabic words. CRIME79 is neither of these. The first thing that struck me about him was his height, he's quite tall which is a bonus for a writer. He appeared to be very bright and gave his answers in measured tones, never making a claim that he couldn't back up. I had been wondering how to describe CRIME's style for the interview and I came up with the adjective "class", his pieces had great class - not unlike the man himself. I STARTED WRITING IN THE SUMMER OF 77. MOSTLY ON WALL AND BLACK BOOKS. EVEN THOUGHT MY THEORY IS THAT EVERY ONE WROTE AT SOME TIME OR ANOTHER, BE IT IN THE BACK OF THEIR NOTEBOOKS OR WHEN GRADUATION TIME COME AROUND AND WE ALL SIGNED EACH OTHER GRADUATION BOOKS. I WAS RAISED IN EAST NEW YORK BROOKLYN. AT THE TIME I JUST WONDERED HOW THE STUFF GOT ON THE TRAIN AND MATCHED ALLOT OF THE TAGS TO MY NEIGHBORHOOD TAGS. DIKE TOP, JEE 2 /JAMES TOP, MICKEY / TO 729 , IN, IZ THE WIZ AND PI 2 / FANE ARE JUST SOME OF THE EARLY PIONEERS THAT I WOULD LATER ON MEET AND HAVE THE PLEASURE OF BOMBING WITH. GROWING UP IN EAST NEW YORK IN THOSE DAYS IT WAS HARD TO ESCAPE WITHOUT ADDING SOMETHING TO THE URBAN EXPERIENCE, EITHER GANGS, WRITING, RAPPING, DJING, BREAK DANCING. Some of CRIME's early influences. I CHOSE WRITING BECAUSE IT HAD THE MYSTIQUE ABOUT BEING SOMEONE WITHOUT NONE KNOWING WHO YOU REALLY WERE. EAST NEW YORK WAS THE MURDER CAPITAL OF NEW YORK IN THOSE DAYS AND PROBABLY STILL IS. GRAFFITI GAVE US WRITERS AN OUTLET. AN OUTLET TO ESCAPE MANY OF THAT MANY MORE NEGATIVE INFLUENCES THAT WERE GOING ON IN THOSE DAYS. IT MIGHT HAVE KEEP US FROM GETTING HEAVILY INVOLVED IN THE DRUG TRADE, WHERE I BURIED MANY OF MY FRIENDS. GRAFFITI WAS MY OUTLET. MY EARLIEST INFLUENCES… WOW! I CAN REMEMBER SEEING DIKE TOP AND SID THE KID, HURST / OI, JEE 2 / JAMES TOP , JESTER / DY 167, OO 1, MOVIN 2 / TI 149, IZ THE WIZ, FANE / PI 2, KILL 3 / IN, MICKEY / TO 729, SARO FROM THE LL's. DEAN FROM THE BYB CREW, GEAR BYB, UN ONE FROM CRAZY WRITERS, AS 2. OE-3 AND P13 ALL TIME KING'S OF THE INSIDES. DONDI WAS JUST STARTING UP AND I WOULD START SEEING NACO TAGS WHICH WAS HIS ORIGINAL TAG. HE WAS ALSO FROM EAST NEW YORK BROOKLYN. MOVIN 2 /TI 149, IN, IZ THE WIZ WHO WAS FROM OZONE PARK QUEENS ALL OWN THE LINES. DURO 1 WAS JUST STARTING TO COME UP BACK THEN . I REMEMBER BEING ON A ROOF TOP, IN THOSE DAYS MY FRIENDS AND I WOULD FLY PIGEONS AND I SAW A BUS 129 & DURO WHOLE CAR WHICH WAS AMAZING. AT THAT TIME I WAS JUST BOMBING INSIDES WITH A FEW OUTSIDES. MANY BROOKLYN WRITERS DID INCREDIBLE WHOLE CARS THAT WERE NEVER DOCUMENTED. IT WAS A BEAUTIFUL ART SHOW THAT ALLOT OF GRAFF HISTORIANS MISSED. LUCKY I WAS ABLE TO VIEW THAT STUFF. BACK IN THE LATE 70S EAST NEW YORK WAS FULL OF GANGS, THE CRAZY HOMICIDES WOULD LIVE DOWN THE BLOCK FROM ME. SO I EXPERIENCE THE START OF THE URBAN CULTURE FORMING. MOSTLY HISPANIC KIDS THAT WERE FORMING THEIR OWN SENSE OF FAMILY, FROM WHAT I SEEN IT WAS A SENSE OF JUST WANTING TO BE HEARD. THE MOST POPALUR GANGS I REMEMBER GROWING UP WERE THE MOUNTAUK CHEST BREAKERS, THE CRAZY HP's WHICH WHERE THE WHITE BOY GANG THAT HAD THEIR TERRITORY BY HIGHLAND PARK. THE NOMADS, THE SANDMEN, THE SOUL LATIN BROTHERS , THE BIKERS FROM WILLIAMSBURG BROOKLYN ... ETC. I NEVER HAD A PROBLEM WITH THEM. I GREW UP WITH THE WARLORD OF THE CRAZY HOMICIDES. I REMEMBER HIS NAME WAS HOLLYWOOD, SO AS WE BOTH GREW UP WE DRIFTED. BUT HE KNEW WHO WE WERE, AND WE GAVE EACH OTHER RESPECT LATER ON AS I BECAME KNOWN AROUND THE NEIGHBORHOOD FOR MY TALENTS. MANY OF THEM WOULD ASK ME TO PUT THEM UP WHEN I WENT BOMBING. THEY KNEW WHO I WAS SO THEY GAVE ME MY RESPECT AS I GAVE THEM THEIRS. BACK THEN GANGS WERE ABOUT TURF... PROTECTING WHAT WAS AROUND THEM. SO I NEVER ENCOUNTERED ANY BEEF. THE FIRST EXPERIENCE HITTING UP MY NAME... I REMEMBER WAS MUCH LIKE MANY WRITERS. COMING HOME FROM SCHOOL, YOU WOULD GATHER WITH ALL THE TOY WRITERS AND GO TO THE BACK CAR AND THROW UP YOUR LITTLE TAGS WITH SMALL MARKERS. IT WASN'T MUCH. WHAT DID IT FOR ME WAS SEEING THAT TAG AGAIN ON ANOTHER DAY. THAT TO ME WAS LIKE WOW. IT WAS LIKE HAVING MY NAME UP IN LIGHTS . EVEN THOUGH IT WAS PROBABLY ON A SEAT OR WINDOW SOMETIME MAYBE A PANEL. TO ME IT SAID THAT I WAS THERE AND IN SOME CRAZY WAY THAT I HAD ACCOMPLISHED SOMETHING AND THAT OTHERS SEEN MY ACCOMPLISHMENTS. THE FIRST ACTUAL BOMBING OF THE SUBWAYS WAS WITH SOME OLD CATS THAT I GREW UP WITH, DOC 2, JB, MEXICAN AND SR. WE HAD CUT OUT FROM SCHOOL AND WENT DOWN TO AN OLD PRINTERS STORE TO BUY PILOT MARKERS. WE THEN WENT DOWN TO BOWERY LAY-UP IN MANHATTAN AND BOMBED THE INSIDES. WE DIDN'T KNOW WHAT WE WHERE DOING. WE DIDN'T EVEN TURN ON THE LIGHTS. WE DIDN'T KNOW HOW , HA HA. IF I CAN REMEMBER WE PROBABLY WROTE ON THE SIDES OF THE TRAINS WITH MARKERS. LOOKING BACK NOW. LATER ON I SAW MANY OF MY WHOLE CARS WRITTEN ON BY NAMES THAT I COULDN'T TRACE BACK TO ANYONE. DAMN TOYS! BUT YA KNOW WE ALL START OUT LIKE THAT. I'M SURE WE'VE ALL BEEN THERE. BEING THAT I GREW UP IN THE GANG ERA. I NEVER INHERITED THE IDEOLOGY OF MOVING IN CREWS AND BEING PART OF A GANG. I WROTE FOR MYSELF, BY MYSELF AFTER A WHILE. MANY OF THE WRITERS I STARTED OUT WITH STARTED TO GET INVOLVED IN DRUGS. PARTYING, DJING. 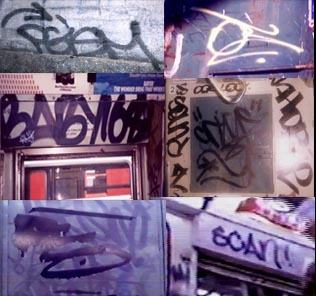 Tags of some of the cats that rolled with BAD CRIME79. in order BABY168, OE3, PEO and SCAN. WHICH WAS KOOL FOR THEM BUT I HAD OTHER ADDICTIONS IN MIND. I WANTED TO PAINT. SO WHEN THERE WAS NO ONE TO GO WITH. MANY TIMES I USE TO PACK MY BAG OF PAINT AND GO BY MYSELF. I MET A LOT OF WRITERS BACK THEN THAT WAY LIKE PG 3, OE-3, P13, ETC.. THEY WOULD PUT ME DOWN AND FROM TIME TO TIME I WOULD I PUT THEIR CREW UP. IT WAS A DIFFERENT TIME IN THE EARLY DAYS. IT WAS ABOUT PAINTING. NOT RIPPING PEOPLE OFF AND CROSSING OUT WITH OTHER WRITERS. LATER ON I HOOKED UP WITH PEO, BABY 168 , BAD BID, NEK, NEL 106 , SCAN, TATU, ALL THE BMT CATS THAT I WOULD LATER BOMB HEAVILY WITH FOR MANY YEARS. AS FOR STYLE I SAW THAT THE I.R.T WRITERS HAD A DIFFERENT STYLE FROM THE B.M.TS. WRITERS EVEN THOUGH WE WHERE ONE IN THE SAME. ME AND BABY 168 HAD SIMILAR STYLES AND WE FED OF EACH OTHER. TO THIS DAY I DON'T KNOW WHAT WE CAN CALLED IT, BUT MANY YEARS LATER WRITERS TOLD ME THAT WE HAD A DISTINCT STYLE. EVEN HENRY CHALAFANT NOTICED OUR STUFF AND GAVE US PROPS FOR ADDING SOMETHING DIFFERENT TO THE MOVEMENT. WE BROUGHT THE B.M.T'S OUT OF JUST DOING BUBBLE LETTERS AND BLOCK STYLES. The famous BABY .. WAVE ( CRIME.79 ) car . Far away shot taken by CRIME.79. The two would have many productions running on the BMT's in the early 1980. The very famous message that was seen in subway art. WE BROUGHT COLORS TO THE LINE DURING THOSE DAYS AND LATER MANY OTHER CATS WOULD JOIN IN. CATS LIKE ATOM, BOLTISM, ERNI, SIZER, MIDG, PG 3. I HOOKED UP WITH MANY OTHER WRITERS AND DID SEVERAL WHOLE CARS WITH CATS LIKE DURO , MAGOO 2, PG. 3 , ETC. 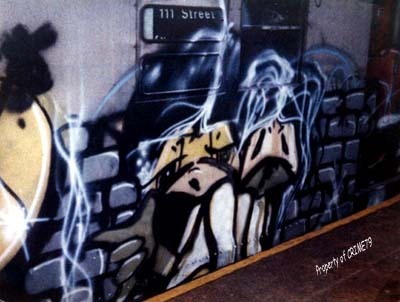 I DID SO MANY GREAT PIECES ON THE SUBWAYS BACK THEN, BUT WHAT HURTS THE MOST IS MANY OF THE PIECES I DID EITHER NEVER RAN, OR GOT BUFFED BEFORE I SAW IT OR GOT COVERED BY SOME WHOLE CAR THAT A OTHER WRITER WENT OVER CARELESSLY. KEPT BOMBING AND DOING PIECES ON MY OWN OR SOMETIMES WHEN I HAD THE ITCH TO PAINT WITH SOME ONE. I WOULD TAKE SOME NEW WRITER ALONG WITH ME TO THE YARD. EVEN IF THE PERSON WAS A TOY OR NOT. IT DIDN'T MAKE A DIFFERENCE TO ME. IF YOU HAD THE SAME FIRE INSIDE OF YOU THAT YOU WANTED TO PAINT, YOU WERE AN EQUAL TO ME. AS TIME WENT ON I NOTICED THE WORKS OF BABY 168 , PEO, BAD BID AND I GUESS THEY NOTICED MINE. PEO TOLD ME A STORY ONCE THAT BABY 168 WANTED TO KNOW WHO I WAS AND SAID THAT HE CAN ARRANGE A MEETING WITH US BOTH. PEO'S GIRLFRIEND AT THE TIME LIVED A FEW HOUSES AWAY FROM ME. HE FOUND OUT WHAT HIGH SCHOOL I WAS GOING TO AND ONE DAY WHEN I WAS LEAVING THE BUILDING, I FOUND A GROUP OF GUYS WAITING OUTSIDE FOR ME. THEY CALLED ME TO THE SIDE AND INTRODUCED THEMSELVES. 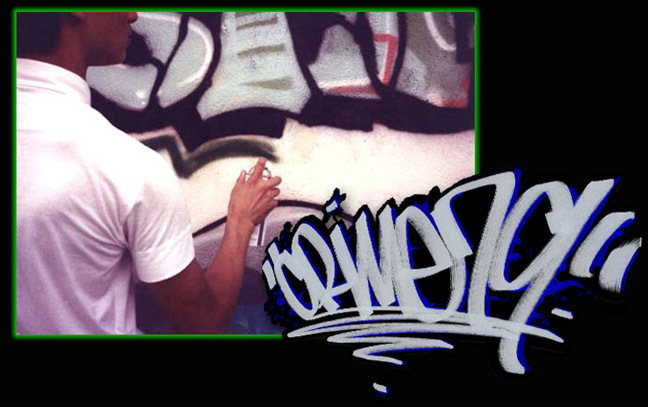 THEY EXPLAINED THAT THEY RESPECTED MY STYLE AS I RESPECTED THEIRS AND INVITED ME THAT NIGHT TO GO PAINTING. FROM THEN ON WE ALL BECAME GOOD FRIENDS. 20 YEARS LATER WE ARE STILL GOOD FRIENDS. BABY HAD THE SAME BELIEFS ABOUT THE MOVEMENT AS WELL AS I DID SO WE GOT OUR MINDS TOGETHER AND PLANNED SEVERAL PROJECTS. A front shot by CRIME79. EVERY LINE. I HAVE BEEN TO EVERY BOROUGH. I LOVED HITTING THE BMT'S BECAUSE I WAS ABLE TO VIEW THEM EVERYDAY. MUCH RESPECT TO THE OTHER LINES. I WAS ABLE TO DO SEVERAL WILD STYLES ON THE 2 AND 5s. THE LAST TIME I PAINTED WAS SOMETIME IN 1985. I WAS GETTING OLDER. THE BUFF WASN'T LETTING MY WHOLE CARS RUN LONG. I WAS GETTING TOGETHER WITH MANY OF THE CATS AT THE SOUL ARTISTS MEETINGS, GOING TO GALLERY SHOWS AND DECIDING THAT I WANTED TO MAKE A CAREER. I STARTED PAINTING AND DOING ART SHOWS. GOING TO SCHOOL TO STUDY GRAPHIC DESIGN AND MOVING ON IN LIFE. MANY OF THE CATS THAT I BOMBED WITH HAD ANOTHER RESPONSIBILITIES. SO WE SLOWLY STARTED TO FADE AWAY. I REMEMBER WRITING THE LAST FEW TIMES . " KINGS NEVER DIE ,, THEY JUST FADE AWAY" THAT'S WHAT WE FELT. OUR TIME HAD PAST. WE LEFT OR MARK AT A TIME. THAT'S ALL WE WANTED. WE ACCOMPLISHED THAT. WE DIDN'T CLAIM TO DO THE BEST. OR THE MOST. OR THE BADDEST. 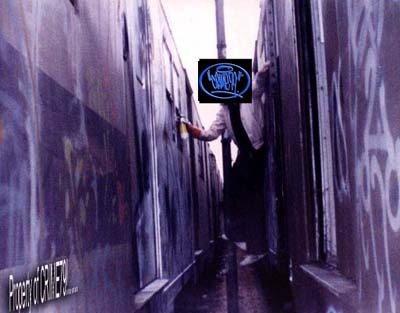 BUT THOSE THAT WERE THERE DOING GRAFF THOSE YEARS CAN NEVER DENY THAT WE ADDED SOMETHING SPECIAL TO THIS MOVEMENT. 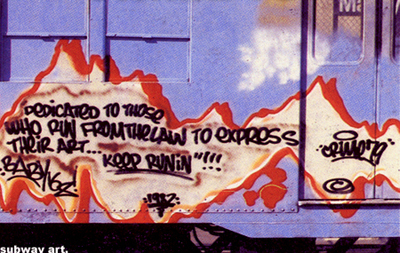 IN ESSENCE, THE GRAFFITI MOVEMENT WAS ABOUT GETTING UP. MANY OF US DID THAT. WE MADE A NAME FOR OURSELVES .AND IN THE INTERIM GAVE THE PUBLIC SOMETHING TO SEE WHEN THEY WOKE UP IN THE MORNING. 20 YEARS LATER THEIR ARE THOSE THAT DISPUTE SEVERAL MOMENTS IN GRAFFITI HISTORY, AND THERE ARE THOSE THAT DON'T KNOW ALL THE HISTORY BECAUSE IT WAS A MOVEMENT THAT WAS TAKING PLACE IN MANY PARTS OF THE CITY AT ONE TIME. I AM HERE TO GIVE MY PART OF THE STORY .AND I ENCOURAGE OTHERS TO DO THE SAME. LIKE MY GOOD FRIEND DURO ONCE TOLD ME. "YOU CANT CHANGE HISTORY. IT IS WHAT IT IS." THOSE THAT WERE THERE REMEMBER IT LIKE IT WAS JUST YESTER DAY. I FEEL ITS TIME FOR THOSE THAT DIDN'T HEAR THIS PART OF OUR HISTORY TO LISTEN TO IT. LIKE I WANT TO HEAR THE PARTS THAT I WASN'T ABLE TO HEAR. DON'T YOU? 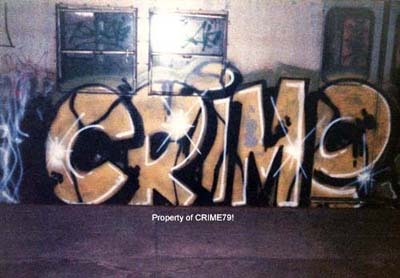 For more information on CRIME 79 Click here for his web site.